This guy takes his Geiger Counter to the beach he normally frequents, and shows us "high" radiation readings. And then he claims it's because of Fukushima. However, carefully thinking about the video we see he's not demonstrating radioactivity in the water, but in the beach sand. That is, he starts on a bluff above the beach where readings start at 90ish counts per minute, then by the time he is in the mid-section of the beach it rises to 150ish counts per minute, and then drops to 60ish counts per minute at the water. He walks back and forth across the beach several times and the same pattern repeats. 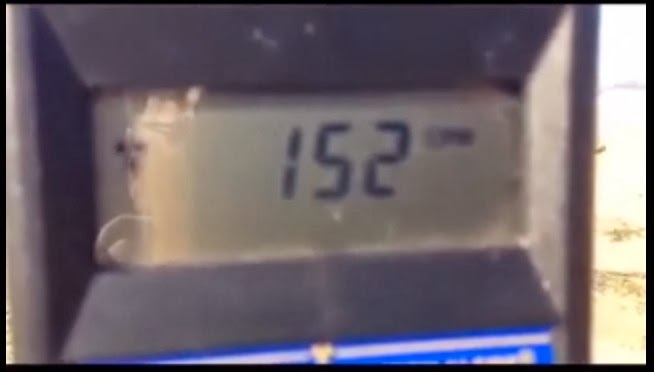 If this were radiation from Fukushima, wouldn't the water be reading as hot? In other words - he counted radiation events, but without knowing what kind of radiation it is. I've been doing some research into geiger counters. The SE Inspector shown here is one of the better varieties because it has a large geiger-meuller tube, making it more sensitive than the cheaper geiger counters. But if the person walking around with the geiger counter doesn't know how to interpret the data all bets are off about the usefulness of information that results. Says the person who knows very little about geiger counters, and just bought one, and may be posting some clueless video in a few weeks. By the way - yes, this geiger counter is sounding an alarm. On this device the threshold where the alarm goes off is configured by the user. You hear him clearly say he set the alarm at 3x what he determined to be "background". And we see in the video that the alarm sounds every time it went above 100 counts per minute. Therefore, the alarm isn't something the manufacturer decided was dangerous, but what the guy who owns this thing thought was dangerous. Radioactive Rain Water - What isotopes are in it? Radioactive Units - Do Not Use Them Incorrectly! As you can see... each of these units uses a degree of energy. You do not know the energy unless you know the exact nature of your source. As a result, you cannot use them. http://www.physics.usyd.edu.au/~marek/pra/index.html - - PRA software for viewing peaks. http://spectrumtechniques.com/ucs30_system.htm - Entry lab-grade setup. Many myths are propogated on the internet concerning Geiger counters. This video seeks to disprove some of the more common myths. I may have missed some, so if you think of any, please let me know. Is the US West Coast starfish die-off due to radiation? For a couple months now oceanographers have reported massive die-off's of starfish where the starfish alarmingly melt away into goo in front of you. Some have taken this as proof that THE RADIATION is here, and causing massive problems. So let's see what we can find along these lines. The following articles were turned up with the search phrase "starfish death west coast cause". Without exception it is described as a disease, though the scientists are still looking for the precise culprit. They believe it has to do with warmer ocean water. This sort of disease has struck starfish populations before. Disease causes West Coast starfish deaths - http://www.mercurynews.com/california/ci_24446327/disease-causes-west-coast-starfish-deaths - An AP news report from November 4, 2013. Describes it as "a disease that causes the creatures to lose their arms and disintegrate" that goes by the name "sea star wasting disease." The die-off is massive, 95% in some locations. Wasting disease devastating starfish along Sonoma Coast - http://www.pressdemocrat.com/article/20131102/articles/131109902?title=Wasting-disease-devastating-starfish-along-Sonoma-Coast#page=0 - Local news article from November 2, 2013 - Again, it's described as a disease. It says this disease has struck localized areas in Southern California before, such as in the early 1980's, but never on this scale. Says that starfish in an aquarium at the San Francisco Presidio had died when seawater from the ocean was pumped into their tank. Mysterious wasting syndrome is turning West Coast starfish into goo - http://www.mnn.com/earth-matters/animals/stories/mysterious-wasting-syndrome-is-turning-west-coast-starfish-into-goo - November 5, 2013 - Again, it's described as a disease, and mentions that there's a similar disease affecting East Coast starfish "where it has been linked to a virus that follows a period of starfish overpopulation" but "the only observed factor for the starfish wasting syndrome has been warmer-than-usual waters (which could conceivably create a breeding ground for dangerous bacteria)." Mysterious disease turning starfish to slime - http://news.msn.com/science-technology/mysterious-disease-turning-starfish-to-slime - Reuters, November 5, 2013 - Again, calls it a disease. Falling Stars: Starfish Dying From “Disintegrating” Disease - http://science.time.com/2013/11/05/falling-stars-starfish-dying-from-disintegrating-disease/ - November 5, 2013 - Again, calls it a disease. This is a more in-depth report than some others. It says that in normal starfish populations this disease affects a small number of individuals, but the scale of the current outbreak is unprecedented. They don't have an identified root cause, and the wasting disease is actually "a whole set of symptoms without a universal cause." They believe the warmer ocean water is a primary culprit, because starfish are cold-water animals, and because bacteria can multiply more in warmer water. Massive Outbreak Killing Pacific Coast Starfish In Droves - http://www.huffingtonpost.com/2013/11/04/starfish-deaths_n_4215015.html - November 5, 2013 - Doesn't say much more than the other reports, calls this a disease. Massive Starfish Die-Off Baffles Scientists - http://newswatch.nationalgeographic.com/2013/09/09/massive-starfish-die-off-baffles-scientists/ - This is an earlier report than the others, dated in September 2013, meaning it has less details than other reports. It's interesting because it's closer to a first person report of one scientist on a dive in Alaska. Video: Sea stars (starfish) die-off seen in West Seattle waters - http://westseattleblog.com/2013/11/video-sea-stars-starfish-die-off-seen-in-west-seattle-waters/ - A blog post from late November 2013, in which an individual diver in Seattle posted some videos of the effects in Puget Sound. Calls it devastating. Why Are Sea Stars Dying from New Jersey to Maine? Divers Asked to Report Large Groupings of Starfish - http://www.sciencedaily.com/releases/2013/07/130723134250.htm - This July 2013 report goes over an outbreak on the East Coast. They describe it as a disease, and have maps and other data available. Most of the effect is in the southern half of California, however locations of starfish die-off are present as far north as Alaska. 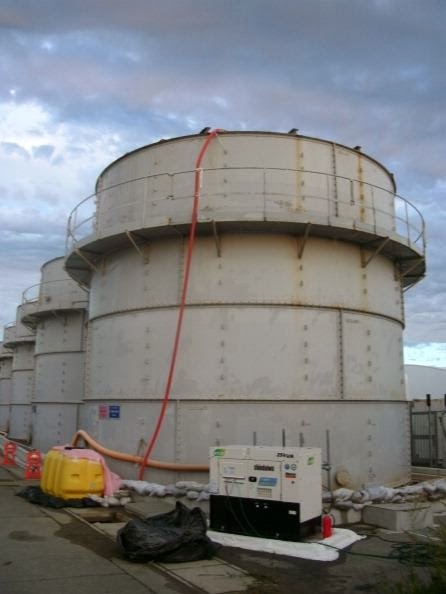 As has been reported earlier - the water storage tanks at the Fukushima site were shoddily built using labor teams that were questionable. Storage tanks at the Fukushima nuclear plant like one that spilled almost 80,000 gallons of radioactive water this year were built in part by workers illegally hired in one of the poorest corners of Japan, say labor regulators and some of those involved in the work. In August, one of the tanks was discovered to have leaked about 300 tons of water, raising global alarm over Japan's handling of the crisis and prompting the government to order that the makeshift, bolted tanks like those assembled by the Okinawa crew be replaced by sturdier, welded tanks. Some scientists have published a peer-reviewed study looking at rates of disease in California babies following the Fukushima nuclear disaster. They found elevated rates of congenital hypothyroidism (CH) that match expectations based on increased radiation in the environment. Supposedly. "We just published a study in the Open Journal of Pediatrics. We looked at official two types of data: one was the EPA statistics on how much radiation was in the air in the weeks and months after Fukushima (it was much higher in the West Coast than in the rest of the country) and number two – we looked at the state California’s official statistics on newborns who are born with a condition called hypothyroidism which is where the thyroid is underactive. It is something that is known to be affected by exposure to radioactive Iodine which is only created in atomic bombs which haven’t been exploded for years and nuclear reactor emissions," explains Joseph Mangano. U.N. nuclear experts arrived in Japan on Monday to assess the decommissioning of the wrecked Fukushima nuclear plant and the operator's progress in removing fuel rods from a destroyed reactor building and minimizing leaks of contaminated water. "There continues to be significant public disquiet over the disclosure of various issues around the Fukushima plant, including the water contamination issue into the Pacific Ocean despite the government's increased involvement in the clean-up activities," Tom O'Sullivan, founder of independent energy consultancy Mathyos Japan. AFP - Typhoons that hit Japan each year are helping spread radioactive material from the Fukushima nuclear disaster into the country's waterways, researchers say. The study is not talking about moving contaminated ocean water at a higher rate. Instead, it's talking solely about contaminated soil being washed into the ocean. Rice from Hirono, Fukushima prefecture, will be served at dining halls and imperial residences. As requested by Japanese Emperor Akihito, some of the first rice harvested in Fukushima prefecture since the March 11, 2011 disaster and subsequent nuclear meltdown has been delivered to the Imperial Palace in Tokyo. The Imperial Household Agency confirmed that 120 kilograms of Koshihikari premium rice from the town of Hirono arrived on Tuesday. Hirono, a seaside municipality of less than 6,000 people, is located just 20 kilometers from the stricken Fukushima Daiichi nuclear plant. The town was included in the emergency evacuation zone after the earthquake and tsunami that created one of the world’s most severe nuclear disasters. Public health concerns about irradiated Fukushima produce have devastated the livelihoods of local residents. While that's nice that the Emperor is voting with his health, in actuality Hirono is south of the Fukushima Daiichi nuclear power plant. Most of the radiation released from the power plant went in a north-westerly direction. 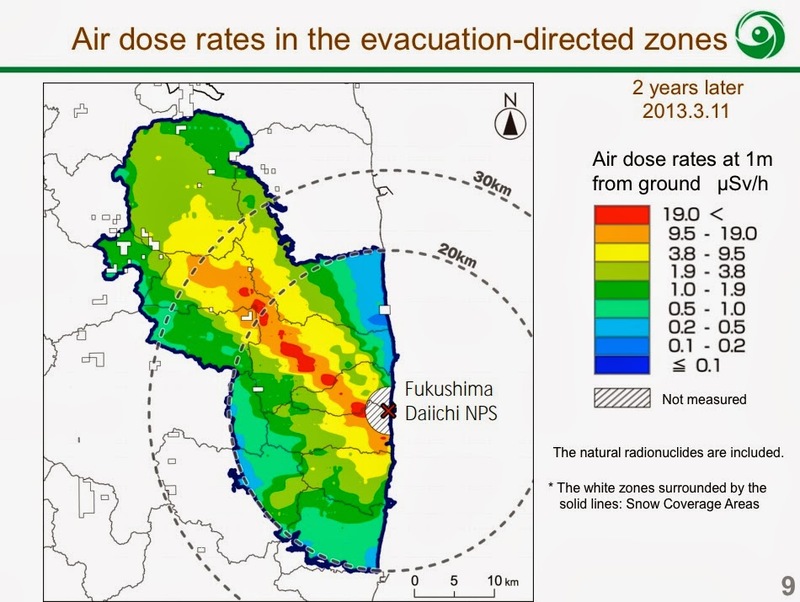 While Hirono was within the evacuation zone, it did not receive much radiation. In other words the Emperor is not taking much of a risk, but it's a nice symbolic gesture. The trouble-prone water decontamination system at TEPCO's crippled Fukushima nuclear power plant sprang a hydrochloric acid leak and had to be shut down on Sunday. The acid is used to neutralize alkaline water used in decontaminating the radioactive water that cools the damaged nuclear reactor piles. While only a tiny amount of acid leaked, it forced the shutdown of a system that was to have played a crucial role in the Fukushima site cleanup. The Fukushima nuclear reactors were damaged and had nuclear meltdowns following a massive earthquake and Tsunami in March 2011. The damage is so extensive that the normal cooling systems aren't functioning, and TEPCO is having to pour massive quantities of water onto the nuclear piles to cool them down. In an inspection of the Advanced Liquid Processing System, TEPCO engineers found Hydrochloric acid leaking from a pipe joint. They surrounded it with a plastic bag, which has collected only 1 liter of acid. This system was in trial operation, and has been expected to play a crucial role in treating contaminated water at the Fukushima site. The system was due to have gone into full operation on Sunday. In late September, plastic padding was found clogging pipes in the same system. In October, it had to be shut down due to a programming mistake. TEPCO is facing a huge task, with storing hugely massive quantities of water that had been used to cool the nuclear pile. That radioactive water cannot be released, and given the massive amounts of water required to keep the nuclear piles cool, TEPCO has built a huge array of storage tanks. However the problem is not scalable due to the number of years that will be required to cool the nuclear piles, hence the amount of water and storage tanks that will be required. Any kind of water decontamination system will alleviate the need for on-site water storage.